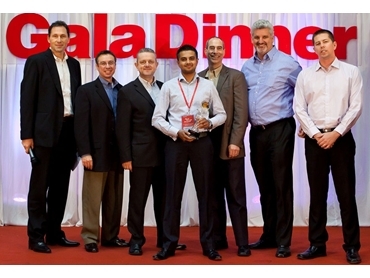 Leading supplier of logistics automation, logistics IT, materials handling and storage systems, Dematic was a winner at the recent Honeywell Partner of the Year Awards held during Honeywell’s 2012 Asia Pacific Partner Conference. Dematic received the award for delivering the largest LXE project within the region and for its continued market development and product introductions including the recently released LXE Thor vehicle mount terminals. Dematic’s General Manager of Real Time Logistics, Nathan Taylor who accepted the award said that the Honeywell Partner of the Year Award recognised not only the size of the project but also its successful design and implementation. He added that Dematic’s track record, size and scale as well as their comprehensive service and support offering were critical to winning the large project. Dematic’s Real Time Logistics group is Australasia’s leading integrator of mobile computing and IT solutions for supply chain applications with services including wireless network design, installation and support, Vocollect voice systems, mobility solutions, RFID, vision and POD systems, systems integration as well as 24/7 service and support.